For a few years now we’ve been reading various articles and studies regarding LED light for horticulture, horses and livestock. Where do we, the humble human being, fit into this scenario? Are we the forgotten species? 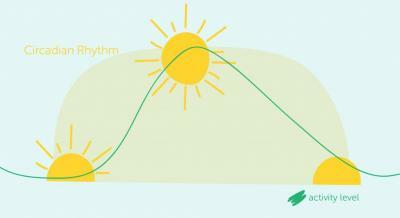 Circadian rhythms are mental and physical changes that naturally occur around a 24 hour cycle. These are the processes of living beings, plants, animals, fungi and, yes, humans! Circadian rhythms are important in determining behaviour patterns such as eating and sleeping, and can be influenced by external factors such as sunlight and temperature. This is where “human centric lighting” comes into play – the term for lighting which is designed to promote physical and mental health and even concentration and productivity. Daylight naturally increases the level of human activity whilst darkness readies the body for the sleep phase. With so many of us now spending our days cooped up in office buildings away from the natural sunlight that promotes our various physical and mental states throughout the day, dynamic lighting could have a real impact on mood and productivity. Dynamic lighting varies the lighting level, distribution and colour temperature, controlling the light to aid concentration, mood, physical activity and sleep. Bright light in the morning will improve mood and alertness, bright light in the evening can supress melatonin levels and affect sleep. With dynamic lighting evening light levels can be set at a much more comfortable colour temperature and brightness to allow melatonin production and aid a good night’s sleep. Hospitals and care homes can benefit hugely from human centric lighting as residents, patients and staff have limited access to daylight. A light cycle that includes sunrise, daylight and sunset simulations can assist the natural circadian rhythm. This improves the patient’s mental wellness, preventing low moods and depression, encouraging communication and helping to induce sleep – reducing the need for antidepressants and sleeping aids. The staff in a healthcare setting can also benefit. Not only is their wellbeing improved, they experience fewer headaches in the evening, and workload can be more effectively handled as patients experience activity and resting phases at the correct time. Human centric lighting can not only replicate the usual light cycle to keep circadian rhythms aligned, it can also be used to shift the natural rhythm – for instances where shift workers are on a 4 or more night pattern shifting the rhythm to keep workers awake in the evening but allow for sleep straight after is advisable to improve productivity, alertness and even reduce accidents. LEDs can play an important role in the delivery of human centric lighting, but the science must be right. Further knowledge and additional research is required in the area of human centric lighting to allow for successful implementation of such complex systems. With the required investment human centric lighting will certainly be a huge growth area in the next decade – and it should not be limited to industry, healthcare and education but to all lighting. Copyright Forge Europa 2019. All rights reserved.